The PSA cycle is very similar to the VPSA. The main difference is that the PSA process operates at much higher pressures. The operating pressures of a pressure swing adsorption oxygen generator are normally at 100 PSIG. 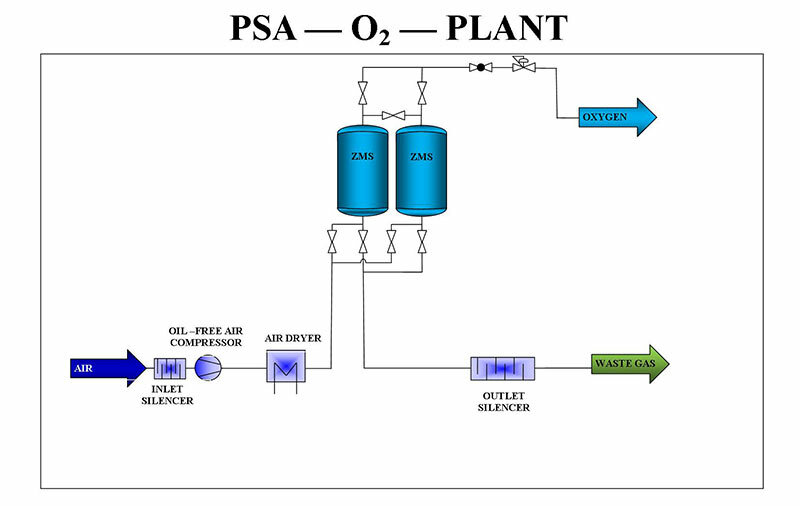 This allows for the elimination of the Vacuum step necessary in both the VSA and VPSA process as during the vent cycle there is sufficient pressure differential to allow for the release of the Nitrogen from the Zeolite during the regeneration step of the process. The nominal rating of the generators are at 68°F; 0% RH and at 14.5 Psia. Flow and pressure values are averages throughout a cycle with tolerances of ±4%. Purity values are + / – 2%. PLC Control for reliable, accurate control of system. System is equipped w/ panel displayed error indicator. System is designed w/ ease of service and maintenance. Pre-filtration system ensures superior equipment life w/ periodic maintenance. Upgraded PLC, w/ 2 or 4 lines of display. With additional I/O capacity. Telemetry and remote display and operation also available. For more information on GENERON® PSA Oxygen Generators, please contact us at +1.713.937.5200 or or using our online form.